A5Doc is the only tool to capture every object on the Alpha Five control panel for searching and printing. It is the only tool sold by Alpha Software for database documentation. In fact, Alpha is the exclusive sales agent for A5Doc. If you have not purchased this add-on, these pages will describe why A5Doc is a valuable addition to your Alpha Five development environment. Click on a link at the left to see sample screens and output. Ready to purchase A5Doc? Alpha Software sells the license key. Follow the link on the Purchase page. A fully functional copy of A5Doc can be run in "trial" mode in order to evaluate the capabilities in your own environment. Get the latest copy from the Download page. For previous users, see What's New. Basically, A5Doc gives you x-ray vision into your database. It finds every script, both Action and Xbasic, in every possible location - from layout events, to toolbar icons, to field rules. It captures layout calculated fields, object names, and filters. 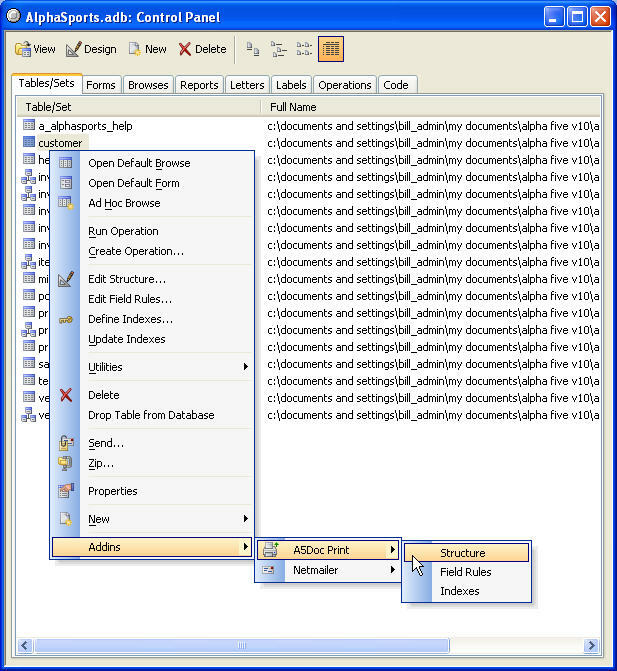 It documents the Xbasic for every operation in the database. Within Alpha Five, all of these things can be seen in design mode, but it is not possible to print them, or to search them. A5Doc does it quickly and easily, and lets you customize the output. This is, by far, the most reliable and complete way to see what is happening inside an Alpha Five database. Most importantly, A5Doc provides sophisticated search capabilities to let you analyze all this documentation. To access the full A5Doc main menu, right click inside the control panel. Right click on a single item for quick documentation.